Motorola has revealed a new 'slim and stylish' flip phone in the shape of the Motorola Gleam, which is available from Carphone Warehouse now. It may look familiar; that's because 'great design never goes out of fashion', according to Motorola, which may or may not have had a team of five rooting through the bins for rejected RAZRdesigns for months. It's not just about looks though; the handset comes with all the mod cons: FM radio, MP3 player, 2MP camera with video capture mode and even a matrix! That's an LED matrix, which displays friendly little messages like 'hello' on the lid. As well as being able to send and receive SMS and MMS messages, the dual-band handset supports electronic mail – that's email, to the kids. There's even WAP 2.0 browser support! Not to be sniffed at is the microSD support for up to 16GB and the 2.4-inch QVGA screen which can play videos in landscape mode – fancy. There may not be Android or iOS or Windows Phone or apps of any kind, but there is a 3.5mm headphone jack and Bluetooth 2.1 with A2DP support so it's not all bad. 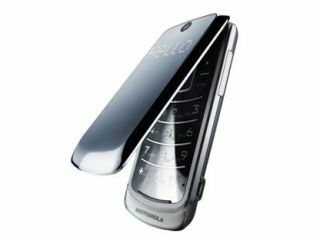 We mock, but the Motorola Gleam will set you back just £49.95 – that's a darn sight cheaper than an iPhone. And Motorola has managed to get a white (or, to use Moto's sobriquet, 'thistle') model out from the get go, which is more than Apple can say for the iPhone 4. But lest we forget, this is a phone based on the RAZR - the handset that nearly sank the brand after Motorola kept re-releasing the same model over and over again before it realised it should try, you know, making new phones instead... we can't help but fear its very presence.